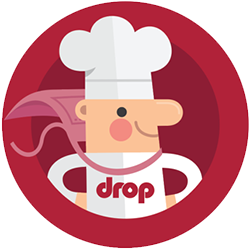 Drop — Where do I download the Drop Recipes app? Where do I download the Drop Recipes app? You can download the Drop Recipes app for free from the App Store if you an Apple device, or the Play Store if you have an Android device. You don't need to own a Drop-powered appliance to use the app and all its recipes, but the experience — and the results! — will be greatly improved if you do. How long is the battery supposed to last? How do I transfer ingredients to another container? Can I use photos I found online in my recipe? What is the best way to clean the scale?